Invoking a classic vision of comfort, your modern living room can be just as elegant as the classic parlors women used to entertain their house guests. The plushly cushioned armchair was thoughtfully constructed with Ultra Down seat cushions and Blend Down back cushions, ensuring the ideal amount of enveloping comfort and consistent support that your body needs. 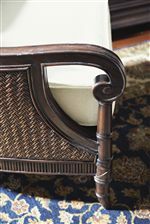 English arms, turned legs, and a rich tapestry fabric finish off the relaxed chair with an extra dose of timeless elegance. 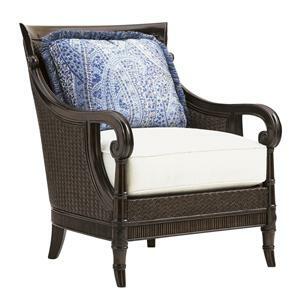 The Island Traditions Kent Wing Chair with Red and Gold Tapestry Fabric by Tommy Bahama Home at Hudson's Furniture in the Tampa, St Petersburg, Orlando, Ormond Beach & Sarasota Florida area. Product availability may vary. Contact us for the most current availability on this product.